Imagine all of your forms online - Donations, Registration Forms, Event Sign Ups, T-shirt orders, and event payments! We can build the forms for you or you can use our super easy form building tool. Your parishioners have been asking for it...and now you can deliver it. Boost donations and event registration by making sign up forms and donation forms available anytime on any size device. The forms can be embedded into the mobile app, your website, an email, or linked to from a QR code or any website link. 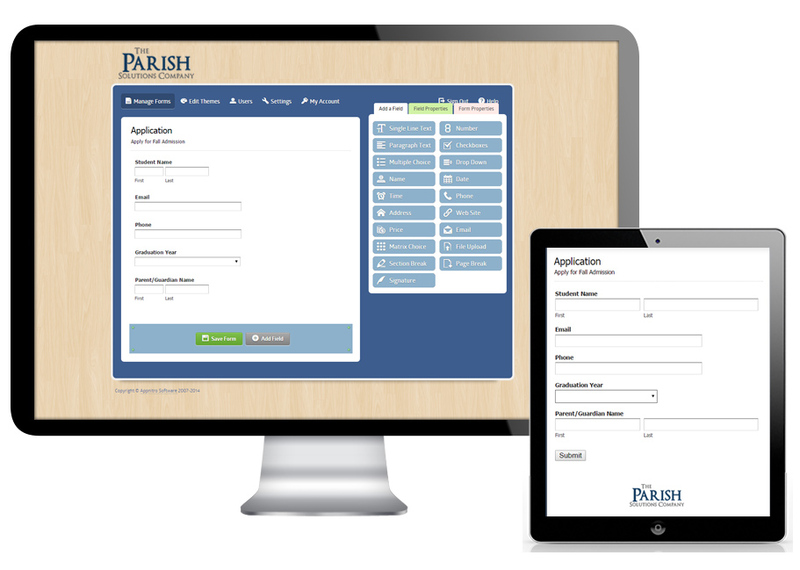 Create the easiest and fastest donation system available for Catholic Churches today. Donors simply enter their name, credit card info, and email address. No physical address. No usernames and passwords. No logging in. No clicking multiple times on multiple pages. No hidden or confusing buttons. No unnecessary information required. Our forms make donations a breeze. Recurring donations are also available. The youth minister, parish admin assistant, and music coordinator can all have their own separate forms! We offer easy integration with five major payment gateways. Two of the options have no monthly or batch fees! You can learn more about those gateways below. Not sure how to do something? Give us a call or email. We are here to help. We also have experience in Catholic Church administration so we likely know what you are trying to accomplish. The ministry of hospitality often begins with the event registration or sign up process. If the sign up processes is not available and easy, those "invited" start to feel not so invited. If it feels like you have to know someone or know a secret to sign up for a Church event, then there is a failure in hospitality. Take a look at your current registration process for events and activities. Pretend you are an absolute new person to the community. Perhaps you have just moved to town or perhaps you stopped by to "check out" a Catholic Church. Would you have any idea how to take the next step in regards to most events and activities? Is it easy and simple to sign up? Do you truly feel like everyone is welcome? What obstacles block you from understanding how to sign up? How could a simple online form help? Time is money. Even among staff and volunteers, time translates into money. Free your staff and volunteers from unnecessary paperwork. Or, if you currently rely on a technical person to create forms for you, save the money you are spending and easily create them yourself. With the ability to temporarily disable forms, you can save them until you need them next year or next month. Eventually you'll barely be doing anything.